Bad mistakes lead to bad landscapes. 5-1-15 – I often forget that this site is constantly stumbled upon and read by a lot of new gardeners, either veteran homeowners who have finally found some time to explore the hobby of gardening (perhaps newly retired, or the last kid is in school) or first-time homeowners who just realized that when you buy a house, the thing comes with property, and the property has stuff growing on it. At the same time, I’m constantly reminded of how many mistakes new gardeners can make when attempting to stick a plant into the ground and getting it to grow. Every year in spring I do a lot of landscape consultations where I show up and walk the property with the homeowner for the purpose of discerning if I might be of service. So let’s put the two topics together. Receiving only low, morning sun, Macrobiota thrives here where Junipers would fail. If I had a dollar for every time I’ve been shown a perennial, shrub or tree planted by a homeowner within the past three years that’s not fairing well and replied, “It’s not getting enough sunlight” I’d have, I don’t know, a couple hundred bucks. Matching the plant to the place in your property where its sunlight exposure needs are met is critical. If tall shade trees enter the equation, understanding that the angle of the sun and the amount of sunlight across the property changes spring to summer to fall, is critical. Understanding that five or six hours of direct sunlight from sunrise to noon or one o’clock is not the same as five or six hours of direct sunlight from ten a.m. to three or four p.m. is critical. Any plant you purchase tells you its sunlight requirements on the plant tag. For new gardeners that’s not much help, it’s like being told the answer to a calculus question when you don’t know calculus. So here’s the best article you can read to get up to speed: Deciphering the Sun. NOW – relatively new gardeners who just stumbled upon this site, I want you to understand something very important: Plants will take several years to tell you they are planted in incorrect exposure. It’s not like screwing up a soufflé recipe where you find out you made a mistake as soon as it comes out of the oven. We’re talking years. Perennials, they’ll show signs they are not getting enough sunlight (or too much) in one year. Blooming shrubs, a couple of years. Evergreens, three to four to six years. So think about those spruce or pines or junipers you planted in partial shade last fall, or two years ago, that look just fine this spring. Another year, or three, you’ll be taking them out because they are either dead or dying. “It gets enough water, we have a lawn sprinkler system,” I’ve been told. No, no, no. Lawn sprinkler systems, those pop-up heads, do not adequately water trees and shrubs, particularly newly planted trees and shrubs. They will deliver enough water for annuals and might keep perennials semi-happy, but trees and shrubs are much bigger engines. 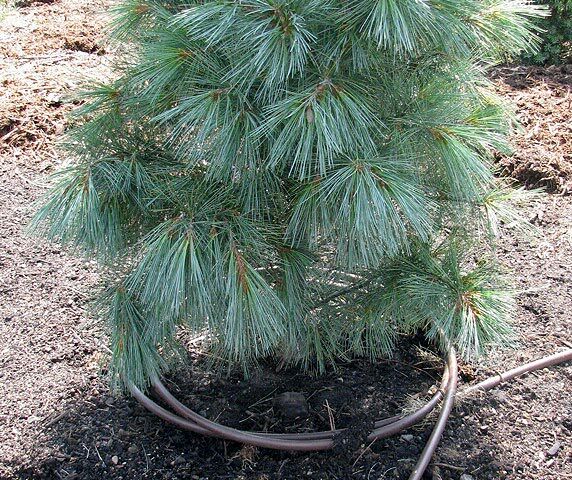 Drip irrigation is the only type to install for watering trees and shrubs. Often the area planted with shrubs and a lovely ornamental tree was previously lawn. Easy-peasy, you might think, get rid of the lawn, plant the area with the shrubs/tree, leave the sprinkler system intact, the watering is done automatically. Or, the lawn sprinkler heads are positioned and set so that they swing their spray across lawn and the landscape beds. The next season, certainly a few years down the road, stuff is dying, and it ain’t the lawn. The key thing to understand is that lawn sprinkler systems programmed for the summer – the thing comes on, in various zones, for an hour or ninety minutes every two or three days – are how grass plants want their water served, but not trees and shrubs. Trees and shrubs want MORE water LESS frequently than a lawn sprinkler system is programmed to deliver. Another flaw in the equation is that lawn grasses don’t mind getting their leaves wet every other day, plus when it rains. However, annuals, perennials, trees and shrubs will encounter increased problems with fungal diseases when their foliage is wetted so frequently. The answer? Either install drip irrigation around trees and shrubs and put it on a different zone than the lawn pop-up heads, so that it delivers more water less frequently, or water by hand. Personally, you are going to grow much healthier perennials, trees and shrubs if you water them by hand, with a hose and a watering wand. I’ve installed drip irrigation systems in landscapes and rarely can it be done where the amount of water being dispersed by the system is accurate for every plant. Drip irrigation is designed so that each emitter hole drips one gallon in one hour, assuming average water pressure. So you count the holes in the loop (or loops) surrounding the plant, and if it’s four and you want the shrub to get five gallons, you run the drip every four days for 70 minutes or so. Watering by hand with a watering wand, you’ll water perennials for around ten seconds. Get a five-gallon pail and time how long it takes to fill it with the hose and wand, and you can figure out how may gallons of water your wand is delivering in a certain amount of time. Always turn your hose on full pressure when watering. And by the way – if you plant a landscape portion with shrubs/trees and install drip irrigation, understand that the drip system is inadequate for newly planted shrubs/trees. Drip does an OK job for maintaining established trees and shrubs (provided a squirrel doesn’t gnaw through it) but you’ll either want to program it to run longer the first two months, or you will want to supplement the drip with hand watering. Go out and inspect your newly planted plants every day. Only by viewing them every day will you learn to recognize a plant that is being improperly watered. The signs are subtle. Only brown, in a year or three years, is not subtle. At the nurseries, containerized trees and shrubs are watered every day. Even the big, balled and burlap (BB) trees you can buy and have delivered are kept moist, the root ball never allowed to dry out. When you dig your hole and plant the thing, you need to water it well – soak it – at the time of planting, then water it every four days for two months. When the temperatures cool and the sun circles lower, you cut to once a week. For gardeners in Zone 3 – 6, where you can get frost in the soil in winter, you cut watering volume by half and water every two weeks beginning in late fall. Too many new gardeners start out watering a newly planted tree or shrub once a week, or every two weeks. Not enough. The root system is just barely beginning to spread, they’re basically just growing in the soil that was in the container, and they are geared to ample moisture. In the container, at the nursery, the roots are in soil that drains well, so the daily watering drains through the container and runs out, or else the plants would die from too much water. Out of the container and planted in your soil, when you water the water gets the soil around and underneath the container soil moist, so it doesn’t drain as rapidly and you can water every four days instead of daily. This is every-four-days-the first-two-months is general advice for trees and shrubs planted in the spring. “There are exceptions to every rule” is an old adage that applies to nothing more frequently than it does to gardening. For instance, if you plant containerized deciduous shrubs in summer, when it’s hot out, they need water every three or two days until the heat breaks. 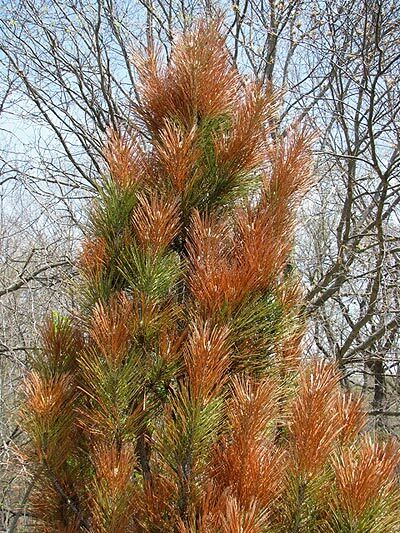 Some evergreens shrubs and trees might hang on and eventually flourish if planted in high heat and watered only every four days, but I’d watch it if the plant is an arborvitae or juniper or chamaecyparis. Use a moisture meter or watch the thing closely, if it’s ninety degrees out it probably needs watering every two or three days, until the heat breaks. This is why it’s best to plant trees and shrubs in fall, number one, spring, number two, and summer as rarely as possible. Oh, by the way, there is an exception to every rule: Watering rates for anything, even lawns, depends on your type of soil. My general rules above are assuming you are growing plants in fairly decent mineral soil to begin with, that drains to some adequate degree. Sandy soils, you’ll find you need to water more frequently. Clay soils, sell the house, start over. 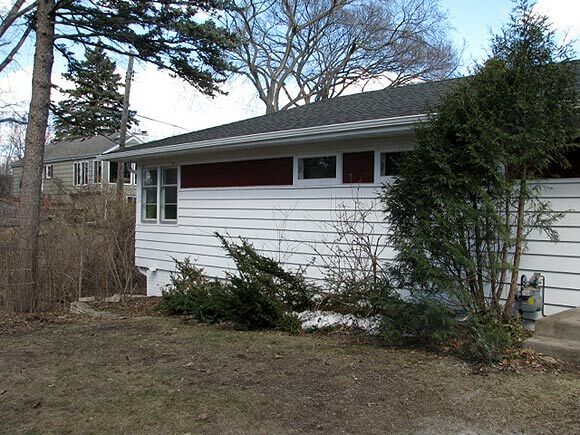 On one visit to a homeowner’s landscape, I observed a row of 5’ Techy Arborvitaes that the homeowner had planted only three feet apart the previous year. Luckily, they hadn’t been watered near enough during their first season, and six of the eight had died. I say luckily because these are huge evergreen hedge plants (and sadly, Minnesota’s State Evergreen Shrub, don’t get me started) that will mature around 15’ tall by 8’ wide (I’ve seen wider). A newly planted landscape won’t often knock your socks off. That starts in year three. Meaning they should be planted at least six feet apart. But the 5’ Technies are only 30’ wide when you bought them, and you want your privacy hedge RIGHT NOW. So you plant them too tight, as their root zones develop they are too crowded and competing with each other for moisture and nutrients, and they suffer and die. 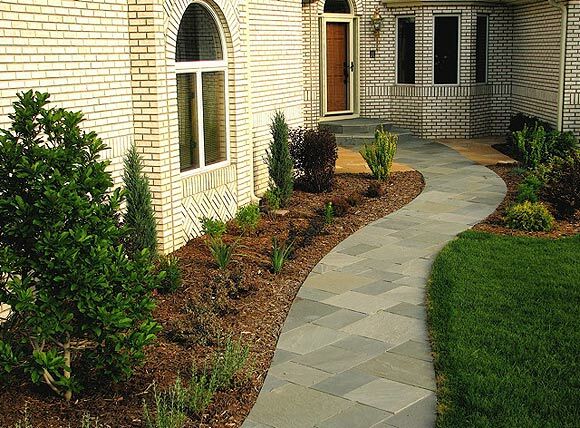 Plant perennials, trees and shrubs according to mature WIDTH. 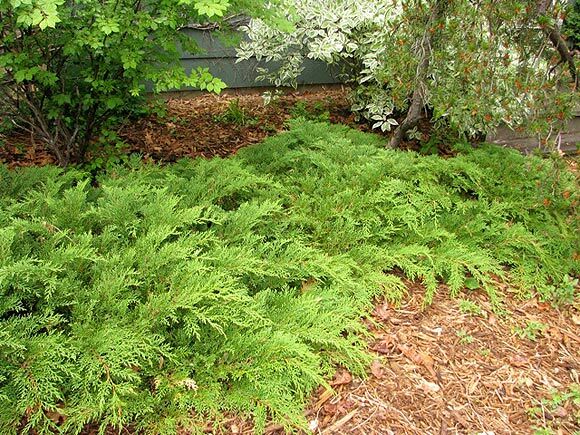 This is especially crucial for evergreen trees and shrubs. Now, plants sidle up to each other and overlap their branches in nature, you don’t have to plant an evergreen hedge or line a fence with a nice collection of tall and short deciduous shrubs that aren’t going to fill in and start intermingling branches until five or ten years from now, but understand that a newly planted landscape should look a little sparse. Have patience, new gardeners. Five, ten years is nothing. Too much green is boring. Shake it up. Green is a splendid color, one of my favorites. Green is nature’s prevalent color. But you’re not creating the planet, you’re trying to brighten up your property. 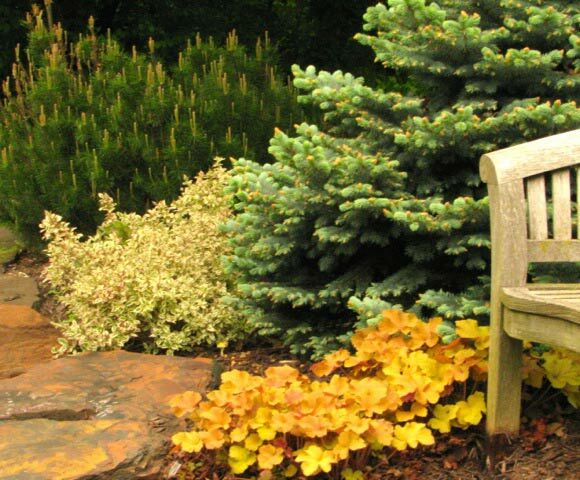 So add plenty of perennials, trees and shrubs that don’t have green foliage. As a general rule, I don’t know, fifty percent green-leaved and needled plants and fifty percent non-green foliage makes for a nice mix. Then remember, there are exceptions to every rule. Mercy my, this is the May 1 update, meaning it’s the last new stuff until November. That’s right, newbies, I’ve a landscaping empire to run and May through October, I’ve no time to devote to the site. So on the first of each month June through October I’ll throw up a favorite existing column of mine from the Archives, then resume writing new columns (and new items under Top Pick, Plant Spotlight, Myth of the Week and Don’t DO That) in November. I do continue to answer e-mails throughout the spring and summer, however, so keep those coming in. You might be interested to know that this is one of the oldest (16 years) and widely linked gardening websites on the Internet, with regular readership in 12 countries. It’s an old, wheezing, outdated frame setup for a website, but it holds a ton of gardening information, so pick and click and read my stuff while you enjoy gardening this summer. I hope to be a part of it.